Remember the dude who was tricked into selling a Banksy painting for only $175? Well, it turns out he’s taking legal action against the man who bought it. Today, Palestenian police confiscated the work, which depicts a weeping goddess holding her head, from Belal Khaled’s home in Southern Gaza. As a graffiti artist, Khaled was well aware of how much he was underpaying, but insisted the purchase was legal. 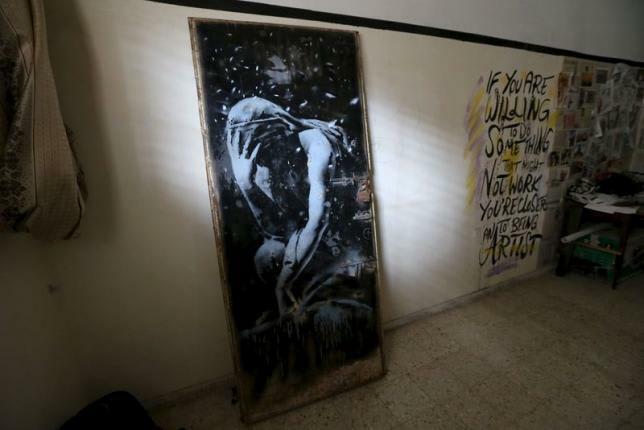 According to a report by Reuters, Khaled said his intention was to preserve the work of the famed street artist—protecting it from neglect or any sort of vandalism. He also confessed it’s been a dream of his to own an original Banksy piece, and will do everything he can to ensure it stays in his possession. "The policemen took the door away and they told me it would be held in accordance with a court order because there was a lawsuit against me," Khaled told Reuters. "I am the true owner of the door now, and I will seek to establish this in court." Rabea Darduna, the man who originally sold the piece, had a similar sentiment: He said he&apos;s the rightful owner of the painting because he was swindled. "I will seek to return the door to its true owner," Darduna’s lawyer, Mohammed Rihan, said. "My client was cheated." Claims to the painting are currently being reviewed by the court. Stay tuned to see how the story unfolds.